Second Third: Spice (cardamon)…brazil nut? Or maybe un-toasted hazelnut? Chocolate, soil, spice, a bit of leather, nuts, bark dried grass, dried soil, barnyard. Being medium in strength and rather rustic, I paired this vitola with its equal–an espresso with a medium roast. 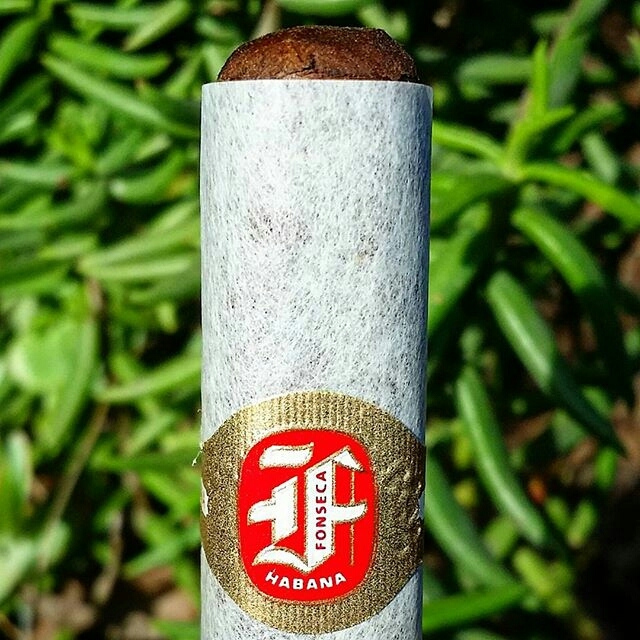 I ended up adding a touch of cream because of the straightforwardness of this particular cigar–it was almost a bit too much with the coffee. Next time I’ll go for a latte. I’ve always been attracted to Fonseca’s packaging. The delicate rice paper wrapper looks elegant, refined, and there is a bit of mystery about them because you can’t see the cigar until you remove the paper. When I finally took the plunge and removed the paper from this particular vitola, I was surprised to find that it revealed a very rustic looking cigar! Made me think of a butler removing his white gloves and showing me his weathered, wrinkled hands underneath. A bit of a disconnect. Overall, the smoking experience was pretty linear. The aromas and flavors were direct–and the smoking experience lacked nuances. While I did enjoy this cigar, I have to honestly say that I didn’t find anything particularly special about it. It didn’t really evolve much, and I don’t think additional aging will do much to improve it. That said, it was well made, well constructed, (albeit the wrapper was a tad too rustic for my taste), and it burned very well. Quality materials. It already has me thinking about what lies underneath the next one.